Regardless of whether or not you agree (and for the record much of the time I do,) with Bill Maher’s liberal perspective on American politics, he is in fact a religious fanatic in his own right. His religion is atheism and he’s not just any other atheist, Bill Maher is a high priest of his ‘ism.’ Like all religious zealots, Maher doesn’t miss an opportunity to insult and degrade members of other faiths. This brilliant humorous and political pundit who eloquently champions progressive values and human rights in the world of politics, is one of the most judgmental and intolerant people you’ll meet when it comes to religion. In Bill’s literal application of his faith, anyone who believes in any kind of deity is guilty of elevating leprechauns and nursery rhyme characters into divine beings. What Bill Maher can’t or won’t recognize is that the God that he rejects with such zealotry is probably not the same God most people of faith actually believe in anymore. And that’s yet another common thread between Maher and other religious fanatics: the god that Maher is sure doesn’t exists and that he loves humorous mock is a totally anthropomorphic being who thinks, acts and behaves like an egocentric, emotionally vulnerable bearded wizard in the sky who does magic. Bill Maher will never discuss or acknowledge the monumental reformations that the two oldest monotheistic faiths have undergone over the centuries. To acknowledge that there are today more sophisticated, spiritual, altruistic ideas in Judaism and Christianity about a higher power that inspires us to love and perform acts of human kindness would be antithetical to his literal, antiquated application of atheism. Progressive theologies, inclusive and tolerant religious teachings subvert Maher’s efforts to paint all people of faith as ignorant, bigoted, fairy-tale believers. 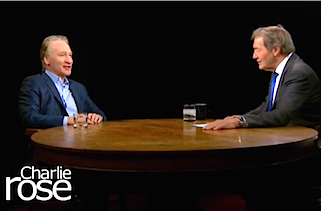 On September 10, 2014, Maher appeared on the Charlie Rose show where he delivered a hateful diatribe about Islam. Maher had no kind words for the second most followed monotheistic religion on Earth. According Maher, all Muslims men are misogynist and believe it is their duty to kill all non-Muslims. No doubt, if Bill Maher had proclaimed similar simplistic defamatory generalizations about Christianity, HBO would cancel his show and he would be a pariah both personally and professionally. If Maher is really so sure that Islam is such an evil force in this world, wouldn’t it be more appropriate for him share those convictions in conversation with Muslims who could affirm or challenge his reasoning? Verbally executing someone or some group who cannot defend himself is cowardly. Those of us who are troubled by Maher’s bigoted rant should join in challenging him to have a civil exchange of ideas with one or more educated, thoughtful American citizens who identify with the Islamic faith. But sadly when it comes to crucifying religion, Maher like all fanatics has little use for facts and ideas that challenge his personal beliefs. In fact, here’s something to think about: I’m sure that if Bill Maher would promise to stay away from talking politics the folks at Fox Noise would love to have another Islamophobic demagogue on their team of professional agitators.